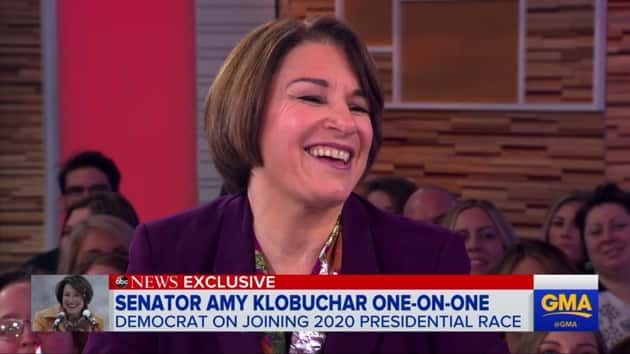 ABC News(NEW YORK) — Minnesota Democratic Sen. Amy Klobuchar on Monday refuted President Donald Trump’s questioning whether climate change is real because it was snowing heavily when she announced this weekend she’s running for president. “I’m sorry if it still snows in the world but the point is that we know climate change is happening. Just this last year it was one of the four hottest years in the history of the world. That’s what’s happening right now,” Klobuchar said. Klobuchar also cited the melting of ice sheets in Greenland and increased wildfires in Colorado and California. The past five years are the warmest in recorded history, scientists from NASA and NOAA announced Wednesday, part of a continued trend of higher temperatures around the world, and 2018 was the fourth hottest year on record. “So that’s why I think we cannot ignore it,” Klobuchar added. “What I said back to him was — when he called me a snow woman — I’d like to see how his hair would fare in a blizzard,” Klobuchar said. It will likely not be the only tweet Trump aims at Klobuchar, a challenge each 2020 Democratic candidate will face from a president who often uses his Twitter feed to insult his opponents. Klobuchar said she plans on using humor as an antidote and keeping the focus on her own agenda. “First of all, you don’t go down the rabbit hole with everything he says,” Klobuchar said. “So, you have to pick your battles with him. And I think you have to use some humor, like I got to do yesterday, right away, because you just can’t take everything seriously. He’s trying to get into every story that you have and you have to set your own agenda. And that’s the only way we’re going to move forward as a country,” she said. Klobuchar is the fifth woman to announce a campaign to challenge Trump for the presidency, joining other Democratic Sens. Kamala Harris of California, Elizabeth Warren of Massachusetts, Kirsten Gillibrand of New York, and Rep. Tulsi Gabbard of Hawaii. But tainting her campaign announcement rollout was a report by HuffPost claiming three people have withdrawn from consideration to lead Klobuchar’s campaign because of an alleged history of mistreating her staff. Asked what she’s learned from the criticism, Klobuchar repeated her appreciation for her staff, as she has in the wake of other articles detailing harsh treatment. She didn’t deny any of the reports, instead focusing on the high standards she said she has for herself and others. “I am tough. I push people, that is true — but my point is I have high expectations for myself, I have high expectations for the people that work for me. And I have high expectations for this country,” she said. The senator is the first candidate from the Midwest to announce, a key region Democrats will need to do well in to succeed in 2020. Though Democratic candidate for president Hillary Clinton won over Trump in Minnesota narrowly in 2016, she lost neighboring Wisconsin and Iowa, as well as Michigan. Klobuchar emphasized her roots as one of the primary reasons she stands out from other candidates for the upcoming election. “I bring a background of growing up in the heartland. I bring some grit to the race that comes from being the granddaughter of an iron other miner and the daughter of a teacher and a newspaper man and someone who has risen to the challenges every time I get a job,” Klobuchar said. “I did that as prosecutor for eight years. I did that in the Senate. The president signed in the last two years 35 of my bills that I have led or been the lead Democrat on. And I like to get things done,” she added. Klobuchar has won the Senate seat three times in her state of Minnesota, with strong showings in rural parts of the state. In her announcement speech over the weekend, Klobuchar laid out an agenda that focused on universal healthcare, a constitutional amendment to overturn the Citizen’s United Supreme Court decision, rejoining the international climate agreement, gun control legislation and advocating for criminal justice reform. Klobuchar will continue her campaign kick-off tour in Iowa and Wisconsin this weekend. Minnesota @SenAmyKlobuchar discussed her campaign goals and reaction to Pres. Trump's "snowwoman" tweet with @gstephanopoulos exclusively with @GMA.